Intracranial aneurysms presenting with mass effect over the anterior optic pathways: neurosurgical management and outcomes. Intracranial aneurysms may grow closer to anterior optic pathways, causing mass effect over these anatomical structures, including visual deficit. 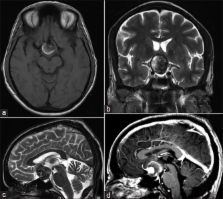 The authors retrospectively reviewed a series of aneurysms in patients presenting with visual field deficit caused by mass effect, to analyze the aneurysm's characteristics, the neurosurgical management of these aneurysms, as well as their clinical, visual, and radiological outcomes. The authors reviewed the medical charts, neuroimaging examination results, and surgical videos of 15 patients presenting with visual symptoms caused by an aneurysm's mass effect over the anterior optic pathways. These patients were treated at the Department of Neurosurgery, Center of Neurology and Neurosurgery Associates, Hospital Beneficência Portuguesa de São Paulo, Brazil. Statistical analysis was performed to identify the variables related to partial or total recovery of the visual symptoms. All patients underwent microsurgical clip placement and emptying of their aneurysms. After a mean follow-up of 38.5 months, the mean postoperative Glasgow Outcome Scale score was 4.33, and the visual outcomes were as follows: 1 patient (6.6%) unchanged, 7 (46.6%) improved, and 7 (46.6%) experienced complete recovery from visual deficits. The variables that influenced the visual outcomes were the size of the aneurysm (p = 0.039), duration of the visual symptoms (p = 0.002), aneurysm wall calcification (p = 0.010), and intraluminal thrombosis (p = 0.007). Postoperative examination using digital subtraction angiography showed complete aneurysm occlusion in 14 (93.3%) of the 15 patients. Intracranial aneurysms causing mass effect over the anterior optic pathways usually present with complex features. The best treatment option must include not only the aneurysm occlusion but also relief of the mass effect. Microsurgical clip placement with reduction of aneurysmal mass effect achieved improvement in visual ability or recovery from visual impairment, as well as total aneurysm occlusion, in 93.3% of the study group. Therefore, this option is well supported as the first choice of treatment for intracranial aneurysms presenting with mass effect over the anterior visual pathways. Pathogenesis of acute monocular blindness from leaking anterior communicating artery aneurysms: report of six cases. This report describes six cases of leaking anterior communicating aneurysms, collected over 37 years, that caused acute monocular blindness. In two cases, surgical and pathologic evidence demonstrated the pathogenic mechanism: As the aneurysm enlarges, the down-pointing dome compresses the optic nerve from above and adheres to it. When the aneurysm ruptures through the adherent dome, it bleeds directly into the optic nerve, resulting in severe headache and monocular blindness. The other cases also suggest an alternative mechanism, namely, direct optic nerve compression by the aneurysm. Influence of surgical or endovascular treatment on visual symptoms caused by intracranial aneurysms: single-center series and systematic review. Intracranial aneurysms of the anterior circulation might become symptomatic by causing visual deficits. The influence of treatment modality on improvement is still unclear. The objective of this study was to analyze the recovery of visual deficits caused by the mass effect of intracranial aneurysms after surgical clipping or endovascular treatment. Between June 1999 and December 2009, 20 patients with unruptured intracranial aneurysms causing visual dysfunction due to compression of the optical nerve were treated at the authors' institution. Visual deficits were recorded at admission and at follow-up. To evaluate a larger number of patients, MEDLINE was searched for published studies involving visual disturbance caused by an aneurysm. A multivariate analysis was performed to find independent predictors for favorable visual outcome. Nine (75%) of 12 patients treated surgically achieved improvement of visual symptoms, compared with 3 (38%) of 8 patients treated endovascularly. A literature review, including the current series, revealed a total of 165 patients with UIAs causing visual dysfunction. Surgical treatment was associated with a significantly higher rate of visual improvement (p = 0.002) compared with endovascular treatment. According to the multivariate analysis, surgical clipping was the only variable significantly associated with improvement of visual outcome (p = 0.02). Aneurysm-related visual dysfunction developed from direct mechanical compression may improve after surgical clipping and endovascular coiling. However, based on the present series combined with pooled analysis of data from the literature, the only factor significantly associated with improvement of visual dysfunction was surgical clipping. A partially thrombosed, fenestrated basilar artery mimicking an aneurysm of the vertebrobasilar junction: case report.